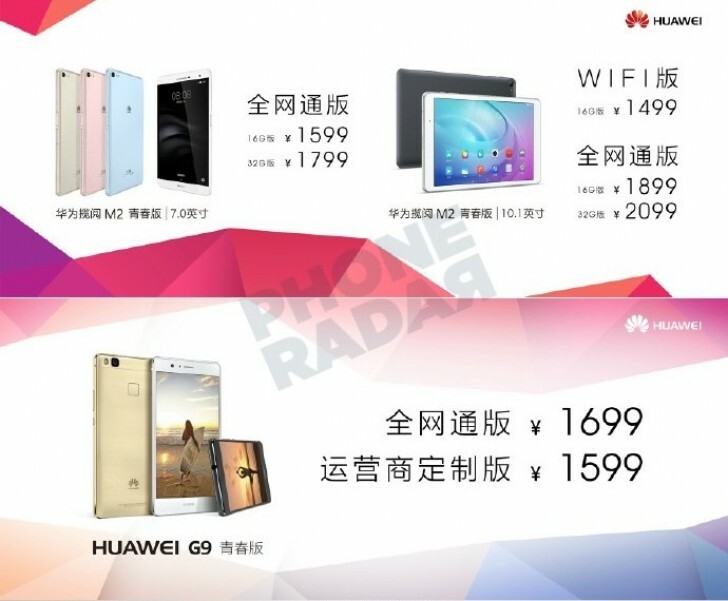 The Huawei G9 Lite is now official in China, alongside the MediaPad M2 7.0 tablet. The Huawei G9 Lite is a localized version of the P9 Lite for the Chinese market. As such, it sports a 5.2" 1080p screen and is powered by the company's Kirin 650 chipset with a 2.0GHz octa-core CPU and 3GB of RAM. The same configuration is also present on the Honor 5C. Internal storage is 16GB and is expandable. Huawei has included a fingerprint reader on the back of the G9 Lite and above it, there's a 13MP camera. The front holds an 8MP snapper with f/2.0 aperture. The phone's battery is 3,000mAh and isn't removable. There's no information on fast charging yet, but we guess it's not on the spec list. The MediaPad M2 was available with either a 10.1" or an 8.0" display but is today joined by a smaller 7.0" variant. The MediaPad M2 7.0 comes with a fingerprint sensor, the first Huawei tablet to do so, and a 1080p resolution display. The battery of the slate is 4,360mAh and will give power to a Snapdragon 615 chipset with 3GB of RAM. The main camera is 13MP with LED flash, while the selfie one is 5MP. The Huawei G9 Lite will cost $260 (CNY 1699) and will be available in white, gold and black. The MediaPad M2 7.0 is $245 (CNY 1599) for the 16GB variant and $276 (CNY 1799) for the 32GB model. Sales start on May 13, but pre-orders are now open.